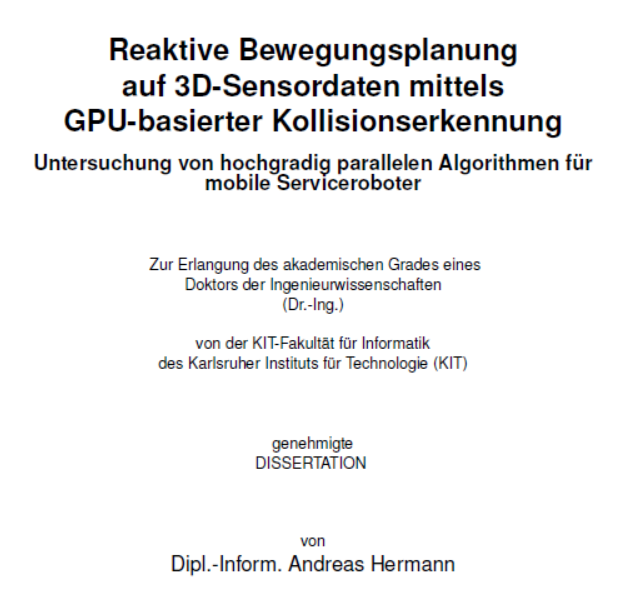 The SFI Offshore Mechatronics robotic facility and work on GPU Voxels developed in WP3 by Atle Aalerud, Joacim Dybedal, Knut Berg Kaldestad and Geir Hovland have been referenced in the following PhD thesis: “Reaktive Bewegungsplanung auf 3D-Sensordaten mittels GPU-basierter Kollisionserkennung: Untersuchung von hochgradig parallelen Algorithmen für mobile Serviceroboter” by Andreas Hermann at Karlsruhe Institut für Technologie (KIT). Andreas Hermann visited UiA on March 13-14, 2018 and gave a guest lecture on GPU Voxels, see https://sfi.mechatronics.no/?p=1447. KIT is one of the leading robotics institutes in the world, and they organised the number one IEEE international robotics conference in 2013, see http://www.icra2013.org.